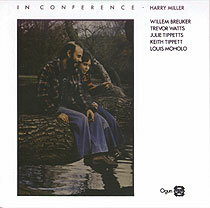 Harry Miller Sextet: Harry Miller, bass; Willem Breuker, soprano and tenor saxophones, bass clarinet; Trevor Watts, alto and soprano saxophones; Julie Tippetts, voice; Keith Tippett, piano; Louis Moholo, drums. Recorded at Redan Recorders, London on 27 January 1978. Sleeve design (reproduced above) by Liz Walton; photograph by Rob Botemann. Re-issued on CD in 1999 as part of Harry Miller box set.